Whether you run, walk or train in the gym; having the proper type of footwear and footwear that is in proper condition will save your feet and joints. and give you more energy. Sneakers and training shoes used on a regular basis should be replaced every 300 to 500 miles or every 3 to 6 months depending the amount of training you are doing (training 2x per week verses 5x per week). Rotating through a couple pairs of sneakers will help to extend their life. For instance, have a pair for running or walking and a separate pair for training at the gym. How can you tell if your athletic shoes have reached the end of their life? Inspect the upper part for wear and tear. Check inside to see if the arch is still there. If there are permanent indents from your toes, it time to give up the shoes. Finally, turn over the shoe and inspect the tread. If the tread is worn down or unevenly, then you are running and working out on two flat tires. What should you do with your worn-out shoes that served you so well? Donate them!! 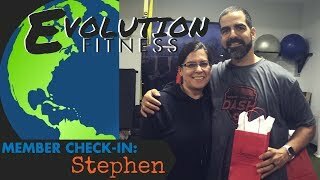 Bring them to Evolution Fitness! There’s a box at the front door. Just tie the laces together and drop them in the box. Your old sneakers will be converted to reusable materials and the sale of those materials will go toward building wells and developing farming communities in under-privileged nations.